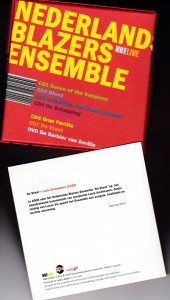 Only 33 minutes of music – in one single track, as is the custom in all CDs with extended compositions of Andriessen’s music that have come my way – but it explodes with huge unleashed energy throughout, opening with a kind paean for oboes that could evoke ancient Greek music (or our fantasy of what it may have sounded like), soon followed by huge brass ostinati, “space” chorus sounding like a mixture of American minimalism and Claude Vivier’s mysticism, followed by high-strung minismalist arpeggios over cantus firmus, and soon rising again to the energy of furious rock and dance music. This reminds me of Steve Martland’s masterpiece, Babi Yar. I don’t have this CD individually, but as part of the restrospective 7-CD + 1-DVD-set issued by the Netherlands Wind Ensemble’s own label, NBE Live – liner notes in Dutch only, not my most familiar language, although with the help of Google and common sense I was able to make sense of them, to which I’ve added other information gleaned online. The text sung by the four female singers, excerpted from Plato’s Republic, is inintelligible to me (online research reveals that it is “Any changes in the modes of music is always followed by changes in the most fundamental laws of the State”), but I don’t think it is so important. If ever Andriessen, as he claims, wanted his piece to be a political message – let alone some kind of revolutionary message (although he himself doesn’t seem to truly believe it: “If only it were true that musical innovation could change the laws of the State!”, he wrote in 1994) – he failed. The music has too much dramatic impact for anyone to care about what political significance it may have. If there’s any political message it’s that the chorus’s Greek scansion might be vaguely evocative of similar things by Carl Orff, and I’m not sure Andriessen would be very happy to be associated with Orff (although, contrary to his reputation, Orff was not a Nazi). The chorus is just sound, adding its own layer to the sound of the wind ensemble, guitars, violas, harps and pianos, it could be singing wordless vocalises or onomatopoeia. as far as I’m concerned. 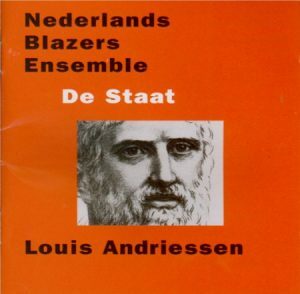 The same Netherdlands Wind Ensemble – but with an entirely different personel, of course -, led by the same Lucas Vis who conducts it here (a version culled from live performances given on 15 and 17 February 2008), had premiered the work, on November 28, 1976. That live recording was published at the time on a 2-LP set, Donemus Composers’ Voice CV 7702 (not sold commercially, limited editon for subscribers only), paired with Andriessen’s Il Principe, Il Duce (an electronic work) and Hoketus. 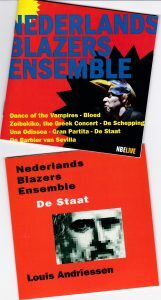 To make things more complicated, Donemus also published under the same label number, CV 7702/b or c (I’ve seen photos online with both), a version of De Staat with the same performers as on the 2-LP set (that includes the four singers) but said to be a live performance from the Holland Festival in 1978… go figure. Anyway, whether the same or different performance, the liner notes to the 2008 NBE-live version claim that, with increased familiarity with the work, the new version is much better, and I’m ready to believe them. There’s also a very powerful live performance (apparently from 1989) that you can hear on YouTube, other orchestra (RTÉ Concert Orchestra – that’s the Irish Broadcasting corporation), other condutor (Reinbert de Leeuw). And Reinbert de Leeuw, a great champion of Andriessen, made a studio recording of De Staat in 1990 with his Schönberg Ensemble, on Elektra Nonesuch 7559-79251-2, barcode 7559792512 or 075597925128 – I don’t have it, and likewise with the 2011 version on Signum Classics, SIGCD273 barcode 635212027325, by the London Sinfonietta under David Atherton – this one, with a complement, Anaïs Nin, an operatic monodrama, and for a generous TT of 75 minutes. Nevertheless: 33 minutes seems a short measure for a CD, but each minute explodes with energy.